The term gluten refers to a variety of proteins produced by plants, including the gliadin in wheat, secalin in rye, hordein in barley and avenin in oats. Grain kernels are composed of the endosperm that is ground to make refined flour, the germ portion that serves as the seed for the plant, and the outer coating known as bran. If you have celiac disease and eat gluten from wheat, rye or barley, your body identifies those proteins as foreign bodies and attacks them. The evidence about the avenin found in oat bran is not conclusive, according to the Celiac Sprue Association. If you have celiac disease, the autoimmune response that occurs after you ingest wheat, rye or barley gluten damages the villi, small thin fingers of tissue that grow inward from the lining of your small intestines. The villi are responsible for absorbing carbohydrates, fats, protein, minerals, vitamins and other important nutrients from undigested food. After they’re damaged by the autoimmune reaction to gluten, they become less effective in that role. If you continue to eat gluten-containing foods, you may become malnourished and develop chronic diseases, including osteoporosis, infertility and diabetes. Researchers have not yet confirmed the role that gluten from oat bran plays in this autoimmune process. The CSA reviewed the findings from a number of studies on avenin from oats and found conflicting results. Some people with celiac disease can tolerate gluten from uncontaminated oat products, but others react with an autoimmune response. The CSA advises using caution when adding oat products to a gluten-free diet, even if you tolerate small amounts of oat products well. 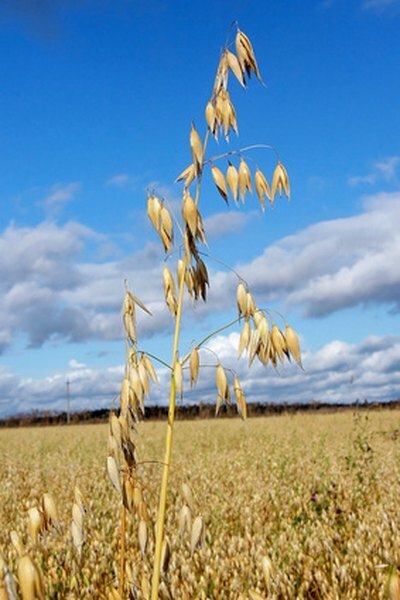 The University of Chicago Celiac Disease Center states that individuals with celiac disease can safely eat up to 1 cup a day of uncontaminated oat products from dedicated plants that test for purity. The Center also recommends talking with your doctor before eating oat products. Oat bran is a high-fiber food that can help lower your blood cholesterol and promote normal bowel function. People with celiac disease or other forms of gluten sensitivity can safely substitute rice bran for oat bran, since the oryzenin form of gluten found in rice does not trigger a negative response. You can also select other high-fiber foods, such as cornmeal, leafy dark greens, citrus fruits, nuts and seeds. Oat bran produced in plants that also handle wheat or barley may be contaminated with forms of gluten banned from the diet of celiac sufferers. If you want to add oat bran to your gluten-free diet, select pure, uncontaminated products made in a dedicated plant. Read the label to ensure that the manufacturer has tested the bran for purity. After you bring the oat bran home, store it separately from gluten-laden foods to avoid cross-contamination.